When you’re in the market for a commercial sound system, it helps to know what the individual components are. Here is a basic overview of the equipment that should be included, in a commercial grade audio system. Use this as a foundation for your research and initial discussions with an sound/audio systems provider. Equipment Rack for placement of components – An enclosure (usually consisting of top, bottom and side panels with open front and rear) made specifically for the safe, yet operationally accessible, storage of installed electronic equipment. These can be stand alone units with, or without wheels, or wall mounted. These units adhere to a standard mounting width (19”) and “RU” (Rack Unit height measurement = 1.75 inches) to accommodate screw mounted installation of professional electronic equipment outfitted with appropriate “rack ears”. Rack shelves (rear and front facing) can be utilized to accommodate units that are not rack mountable. Racks can be assembled with optional components (fans and air filters) to provide cooling of the equipment, as well as security covers/doors (solid, perforated and even transparent plastic (all with, or without, keyed locks) to prevent tampering of settings. Once specific system components have been chosen and required rack space calculated (including space for adequate ventilation), the appropriate rack unit can be selected. Surge Protector/voltage regulator – This unit will help protect the components of the system against damage resulting from voltage irregularities, such as sudden voltage spikes. Modern units have network connectivity allowing for remote access to power up/down and reset functions. All units in the sound system should be plugged into this unit for their electrical power source. It is recommended that surge protection units be used for the mixer, processing and source components. Separate surge protection for the amplifier(s) may not be needed due to most amplifiers having, built-in power protection circuitry. In larger systems, surge protection and voltage regulation can be applied at the power service entry point and should be installed by a licensed electrician. If possible; dedicated circuits for each amplifier are recommended and a separate circuit for the source, mixer and processing units. Mixer or preamplifier – Provides selection and level/volume control of audio sources devices such as: CD player, mp3 player, streaming audio player, external DJ mixer, microphone(s) and instruments from a live set up (which can be controlled via a secondary/sub mixer), and of course, audio from video sources, such as cable/satellite box, DV unit, etc. Crossover – This unit is optional if the system does not require dividing the audio signal to allow for separate control of individual frequency bands, or segments of the signal, such as low/high, or low/mid/high frequencies. Even if the system does not require it initially, installing a crossover unit will provide a more streamlined path for future expansion/upgrade, for example: the addition of a powered subwoofer, which is not limited to just adding more low end, to a system but also increasing headroom and overall clarity to the system by reducing the full range speaker’s low frequency reproduction requirements. Compressor/Limiter – Helps prevent signal levels from overloading the inputs to the units further along the signal chain, by reducing the signal, when it exceeds a selected level, thereby protecting those units (including the speakers) from overload damage. The compressor portion of these units also aid in decreasing the range between low and high level signals, to provide a more consistent program level. EQ (Equalizer) – This unit provides sound shaping (cutting and/or boosting specific frequencies) to assist in compensating for any unflattering acoustic characteristics of the room. This unit also aids in the reduction of possible frequency feedback (the screeching that is sometimes heard when the sound output of a speaker is picked up by a microphone in use) and room resonance (the sympathetic vibration of objects in a room, including floor and walls, due to excessive low frequency amplification and or, poor construction). Speaker Processor – This is the superstar of the modern sound system! Here we have a device that actually takes the place of traditional, stand alone, crossover, compressor/limiter and EQ, described previously with the additional bonus of active feedback suppression (it will automatically sense if feedback suppression is needed while the system is being used and only apply it when needed) and with use of a calibration microphone and onboard tone generators, these units can also provide automated room equalization. For less than the combined cost of quality stand alone units, you also get the “Green”, environmentally conscious, bonus of consuming less space in your rack and less energy via lower current draw and less heat generation. Multi-zone level controllers – These units are designed for use when you need to allow for separate level control of different physical areas of your establishment (bar area verses lounge, main dining area verses private party room and so forth). Select a unit that provides an adequate number of individual outputs for your application (multiple units can be used) as well as connections for wired remote control via wall mounted level controls. These units also have digital processing capabilities and may negate the need for a separate processing unit. 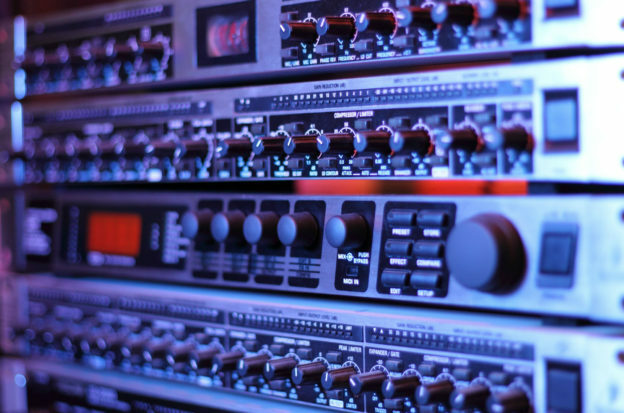 Your audio systems provider will help you determine if additional signal processing will be needed at any individual output, or zone. Amplifier – If you compared an audio system to a car, this would be the engine. The amplifier takes the signal provided by the units earlier in the chain and converts it to a signal usable by the speakers. Depending on system requirements, one or more, amplifiers may be needed. Speakers – Usually installed in pairs of one, or more. This is where the magic happens; these units are placed throughout listening area to provide even coverage, or dispersion of audio signal and they convert (or transduce) the electrical output of the amplifier to the acoustic energy, our ears, recognize as sound. Consider that, as with lighting, the more units used in a system, the better the chances for even distribution of the energy and for customizing the levels needed in certain areas verses others. Powered speakers are speakers which have built in amplifiers and in addition to the requisite signal feed, also require power outlets, at each speaker location. Do not take the decision of powered verses passive speakers lightly; in addition to the aforementioned, powered speakers are far heavier that their passive counterparts and have signal controls that may need to be accessed during set up, or operation thus their placement needs to accommodate such access. Your audio systems provider can serve to guide you on selecting which option is best for your given application. Internet Connection – If your system includes streaming audio as a source option, then this is a requirement. In addition, an internet connection may also offer (depending on option availability on specific units) remote access for calibration, diagnostics, real time adjustments and firmware updates. Cables, wire, connectors, conduit, raceways and jack plates – Budget about 20% – 30% of your total system costs for connecting everything together. There you have it, folks. We trust this information can help you have a better understanding of the complexities of designing sound system and facilitate better communication with your audio systems provider. Custom Playback Systems is available to be your organization’s audio systems provider. The sooner you think about incorporating the sound system considerations and needs, to your plans, the more likely you be able to spend less and spend it wisely. Custom Playback Systems can work directly with you, your architects, contractors and designers to ensure that all elements of the audio system fit seamlessly into your vision.